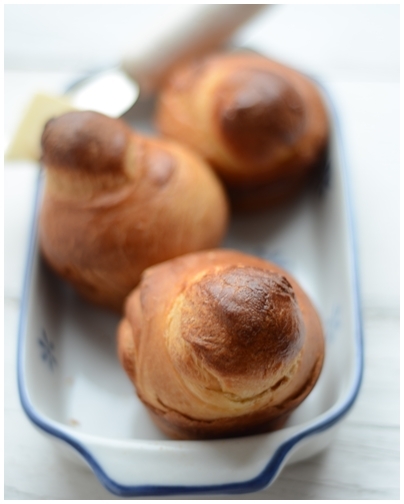 If you're patient, in a few hours you can make brioche. You just need a teaspoon of yeast, a half dozen eggs and almost half a pound of butter along with the usual breadlike suspects. Brioche is classified as a viennoiserie (Viennese Specialties), which are baked goods made from a yeast-leavened dough that are enriched with milk, sugar, eggs or butter. In this case, lots of eggs and butter. Brioche isn't a low-fat treat but an indulgence. The trickiest part of this recipe is the dough's stickiness. But leave the pasty dough to the hook, forget the traditional, hand-kneading method and go check your email. Then, while it's rising, do some gardening. And after you've formed the rolls, go downtown to buy an iPad. Then eat some cake. Translation: "Let them eat rich, expensive, funny-shaped, yellow, eggy buns." In a small bowl, proof the yeast in some warm milk. 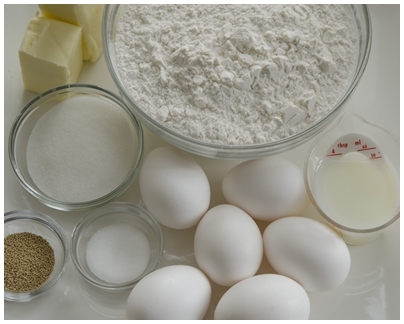 In a stand mixer fitted with the dough hook, whisk all the ingredients. Add the yeast mixture. Knead until the dough forms a smooth ball. In an oiled bowl, place the dough and cover. Let rise at room temperature for 2 to 2 1/2 hours, or until doubled in size. Punch down. In a stand mixer fitted with the dough hook, add the room temperature butter to the dough and knead until the dough is smooth again. Cover and let rest for about 5 minutes. Form into rolls. Let rise for 1 to 1 1/2 hours. Preheat oven to 400°F. Bake for 15-20 minutes, or until golden brown. Let cool. Here's a video showing how to make it by hand. The crust on my brioche was nice and crunchy, but I should have pulled mine out of the oven sooner than I did. Overall, they have a nice texture and warmed in the microwave for about 10 seconds makes them even tastier. Yum, I love brioche! So good by itself, or even used for french toast or savoury sandwiches (especially lobster rolls!). Brioche and a lobster roll sounds good to me! I admire your patience in making this recipe. It looks delicious! 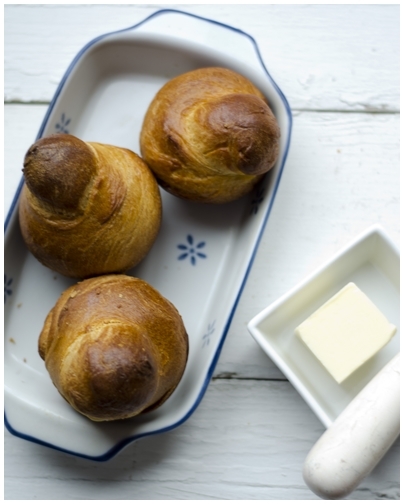 I love brioche and these are great pictures. I love special foods like this for holiday breakfast. Love love love brioche! I don't have hte patience to bake, but you make everything look amazing.